This example shows a bubble plot in which each bubble represents a category of engineer. 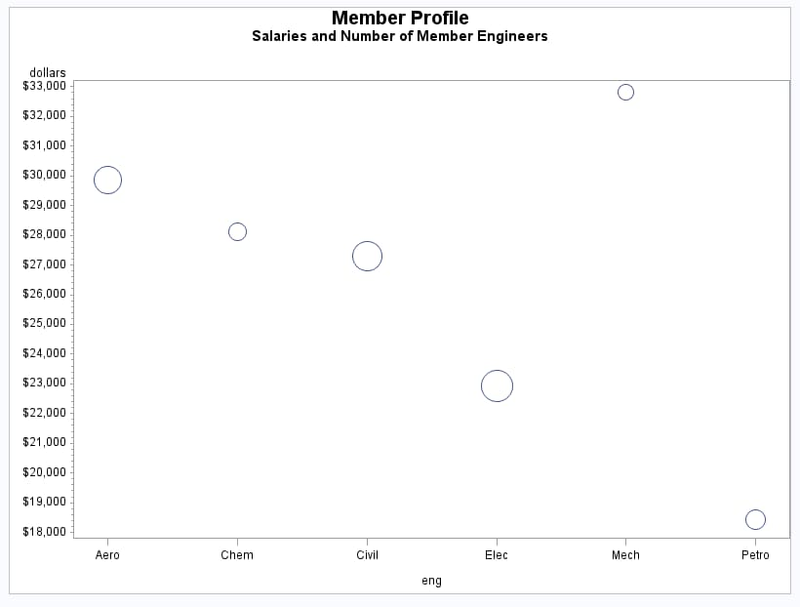 The plot shows engineers on the horizontal axis and average salaries on the vertical axis. Each bubble's vertical location is determined by the average salary for the category. Each bubble's size is determined by the number of engineers in the category: the more engineers, the larger the bubble. Define axis characteristics. The OFFSET= option specifies an offset for the tick marks so that bubbles near an axis are not clipped. Generate bubble plot. The HAXIS= option assigns the AXIS1 statement to the horizontal axis. The salary averages are assigned a dollar format.